The primary reason why I bought this tea while I was in the DavidsTea shop (for browsing purposes, honest) was because of the way it smells. I don’t drink roobios teas often (I make an exception for Birthday Cake though), but it just smelled so good. It has a very rich vanilla fragrance that mingles well with the aroma of the rooibos base and it just smells really, really good. I’m a big fan of vanilla (I love using vanilla extract when baking! ), so having a vanilla tea is kind of perfect. 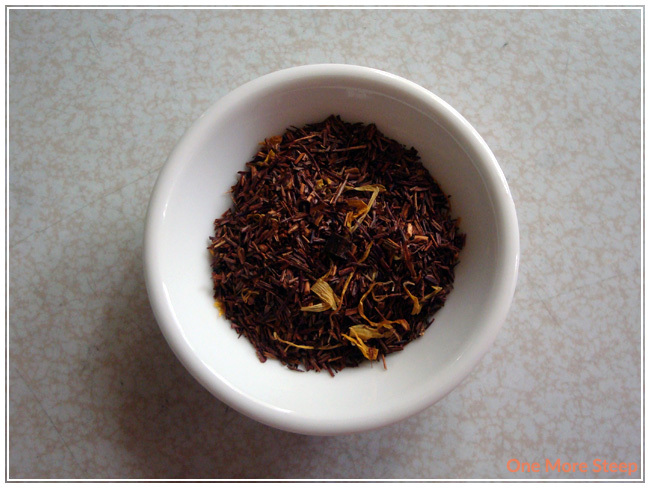 Pure Vanilla is made up of: red rooibos, vanilla beans, marigold flowers, and flavouring. For those curious, the DavidsTea website states that it is natural flavouring (my guess would be vanilla flavouring, given the rich and heavy vanilla scent to the tea). It is an organic tea, if that matters to you. The recommendation is to steep in 96°C (204°F) water for 4-7 minutes. I went right for the middle and steeped for about ~5-6 minutes. For rooibos teas, I like to use tea filters over metal infusers. I find that the rooibos itself is very fine and can get out of infusers, they stay in place better with the tea filters as long as you cinch it up tight. After steeping for about 5 minutes, the aroma is really inviting. It has a nice warm vanilla fragrance to the tea, Pure Vanilla steeps to a rich reddish brown that reminds me of the colour of chestnuts. It smells more heavily of vanilla than of the rooibos. The taste is pleasant. It has a nice light vanilla flavour that mingles well with the rooibos. There is a bit of an oily mouthfeel to this tea, which is I found to be off-putting near the end of the first cup, and there is a bit of an astringent taste to the end of each sip. Just a slight pucker, but it’s there. 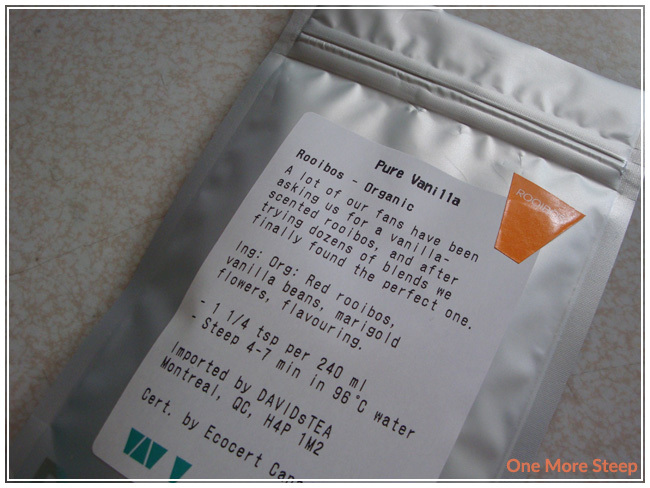 Pure Vanilla does well for a second steeping – the flavour is very close to the first cup! On the third try, it was more of a vaguely vanilla-tasting water. I thought that DavidsTea’s Pure Vanilla was just okay. While the smell and the taste of the tea itself is lovely and quite enjoyable, but the end of the first cup the oily mouthfeel was just not welcome. 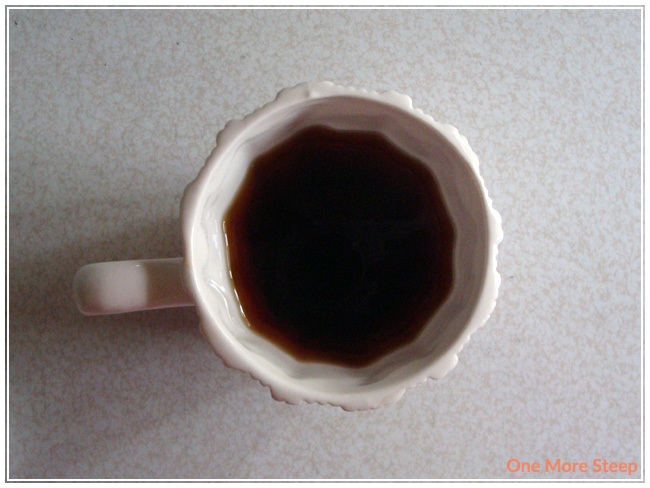 If you have one cup, and perhaps don’t finish the entire cup, you may not get put of by the texture. It’s an alright tea and I can see why DavidsTea wound up using Pure Vanilla as one of the teas to make tea-infused body products with because it smells amazing. I just wouldn’t want to finish a cup of it, which doesn’t really make it worth it to me to stock in my tea stash. It’s good enough for a cup perhaps here and there, but I wouldn’t continually go back to it.